At a recent event sponsored by RBC Royal Bank, Mrs. Diane Benjamin-Smith signed up for a demonstration and test drive of the all new Chevrolet Captiva Sport and got a chance to win an Apple iPad 2. So a couple days later, Mr. & Mrs. Smith stopped in to Nassau Motor for the demo and test drive and their name went into the pot. As luck would have it, Mrs. Benjamin-Smith was the lucky winner! 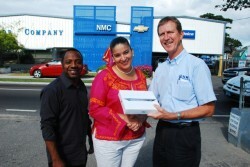 Nassau Motor would like to thank all of those clients that participated in the demonstration and test drive and Custom Computers Ltd for making the iPad 2 available. Visit Custom Computers web site here… or at their new store in the Harbour Bay Shopping Centre for your Apple product needs and desires and stop by Nassau Motor on Shirley street and get your new Chevrolet at special prices for the holidays. Congratulations from the Nassau Motor Team. Shown in the photo below, from left to right are: Mr. Jolyon Smith, Mrs. Benjamin-Smith and Treven Darville, Chevrolet Consultant.